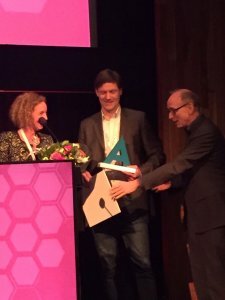 On Thursday 16 February during the fourth edition of the annual Innovation for Health conference in WTC Rotterdam, Marco de Boer of NTrans Technologies won the AXON Innovation for Health Award 2017 for the best innovation pitch presentation. NTrans Technologies was selected out of ten innovation pitches by a jury of investors, headed by Carine van den Brink of AXON Lawyers, the sponsor of the award. NTrans Technologies was founded in 2015 as spin-off of the Hubrecht Institute. The start-up is working on new therapies for the treatment of genetic diseases and cancer. The company has developed a proprietary technology that enables intracellular delivery of proteins and oligonucleotides into patient cells. The iTOP intracellular delivery technology is based on a combination of small molecule compounds which drives the uptake of biologically active large molecules by the cell. One of the applications is the introduction of gene-editing systems, such as CRISPR/Cas, into cells of patients with genetic disorders. NTrans is developing therapies for the repair of genes that cause inherited muscular dystrophies. ‘The innovation can play a crucial role in the current trend of genetic engineering’ according to the jury, therefore they have rated it as very innovative. About Innovation for Health Innovation for Health is the premier event on healthcare innovations in the Netherlands. More than 800 key players in the healthcare & life sciences sector came together last Thursday at the conference in Rotterdam to discuss and contribute to the future of sustainable healthcare. For more information: www.innovationforhealth.nl.